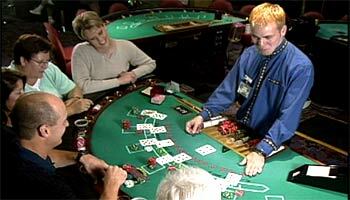 Blackjack tables are usually a semi circle with the dealer on one side and the players seated on the opposite site. The dealer�s back will usually face a restricted area known as the pit, where various casino employees stand, including the pit boss. Blackjack tables will usually have spaces for up to 7 players. If there is an empty space, all you need to do is sit down and exchange your money for chips, if you don�t already have some. All blackjack tables will post information about the rules of the table. The table limits are usually posted in a visible area and define the minimum and maximum wagers players may make. On the blackjack table layout you�ll see �Blackjack pays 3 to 2� which means that players will receive 1.5 times their original bet, plus their bet if the player gets a blackjack. The table will also tell you that the dealer must draw on 16 or less and stand on 17 or more. These rules are usually standard for most blackjack games with table limits changing as the time of day changes. You�ll notice a box on the dealer�s left. This is called the shoe and it holds the cards to be dealt. After the cards are dealt, they are placed in a discard box. Many casinos now use continuous shuffling machines in which cards from each hand are placed after the hand is over and keeps all cards in play for each hand. Shoes and CSMs usually hold 6 to 8 decks of cards. Play will begin as soon as one player sits at the table. Players may come and go from blackjack tables as they like, but must wait until a hand is over to join in. The dealer deals the cards from the dealer�s left to the dealer�s right. The first position to receive cards is called first base and the last person to receive cards is in what�s called third base. Sometimes players in third base are blamed for taking to few or too many cards, when the dealer wins. Advantage players like to play third base, as they get to see more cards in play before they have to make their decision. First base players feel rushed as all the other players must wait from first base before they can play their hand. In any case, you are trying to beat the dealer, not the other players, so try not to let the other players distract you from your play. When you make your wager, you place your chips inside the box or circle in front of you on the table. Once the cards are being dealt, you may not touch your bet - they may think you are trying to adjust your bet after seeing cards. Remember to stack higher denomination chips on the bottom and smaller ones on top. If you are playing with a $100 to $200 bankroll, you should probably stick to $5 blackjack tables, so that you�ll have enough to cover cold streaks and get a decent amount of playing time. Fewer players at a table make counting cards easier. If a table already has players seated, make sure they are the type of players you�d like to play with and your preferred position is open with when making your decision to play. Remember to drop your cash on the table when exchanging it for chips. Casino security restricts dealers from taking anything directly from the hand of a player. The dealer will count out your chips and put them on the table in front of you. You may then gather your chips and place your bet. In a London Deal game your cards are dealt face up. You are not allowed to touch the cards for fear that you may mark them in some way. In a Nevada Deal game your cards are dealt face down. You may only use one hand to pick up and hold your cards and the cards must remain above the table at all times. In a noisy casino, its normal to use hand signals to indicate to the dealer if you want to hit or stand. To hit, signal the dealer by making a brushing gesture on the table behind your cards. To stand, make a horizontal waving motion above your cards. It�s a good idea to tip the dealer. A happy dealer is more likely to help you if you need it. To tip the dealer, place a small wager on the edge of the betting area. If you win the dealer gets twice the tip, if you lose the dealer gets nothing.